CNN’s Jim Acosta. Photo (cc) 2016 by Gage Skidmore. Thanks to the U.S. Department of Justice, AT&T’s monopolistic dreams may not come true after all. According to media reports, the government may block AT&T’s proposed $85 billion acquisition of Time Warner. Even if the deal is approved, AT&T may be required to sell off CNN, one of Time Warner’s crown jewels. Under normal circumstances, such action would be welcome news for those who have long opposed media concentration and its accompanying ills: fewer choices, higher prices, and more power for corporate executives to control what we watch, listen to, and read. But nothing is normal in the Age of Trump. And in this case, it appears that opposition to the deal may be driven less by antitrust law and more by the president’s ongoing fury at CNN. Who, after all, can forget Trump’s outburst after CNN revealed the existence (though not the contents) of the infamous dossier of raw Russian intelligence, which claimed the president-elect had engaged in financial shenanigans and embarrassing personal behavior? “Your organization is terrible,” Trump told CNN’s Jim Acosta at a news conference last January, adding: “You are fake news.” The relationship has not improved since then. I’ve been writing about the threats posed by media concentration since the 1990s. Given the circumstances, though, I think the AT&T-Time Warner deal ought to be approved — and not because (or not just because) it would infuriate Trump. Much as I agree with Karr and Hiltzik in the abstract, I can think of three very good reasons why we might be better off if AT&T winds up as CNN’s corporate overlord. 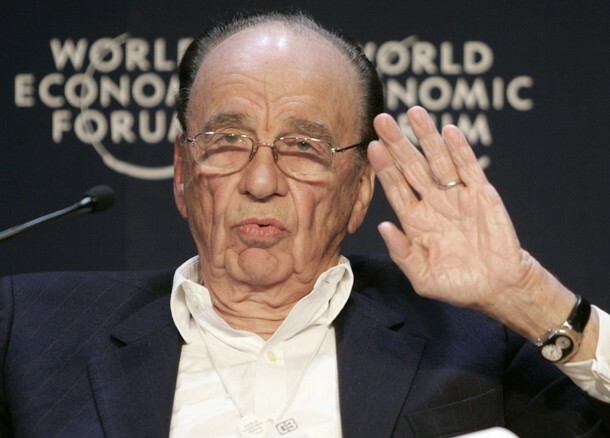 • Rupert Murdoch — yes, that Rupert Murdoch, owner of the Fox News Channel and friend of Trump — has reportedly indicated an eagerness to add CNN to his empire should it become available. According to Jessica Toonkel of Reuters, Murdoch called AT&T chief executive Randall Stephenson twice during the past six months to discuss a possible deal should AT&T be forced to sell off CNN. • A deal that would allow Sinclair Broadcast Group to acquire Tribune Media’s television stations appears to be on track, giving the company control of more than 200 stations around the country. And Sinclair is notorious for using its power in local markets to advance a right-wing, pro-Trump agenda. Over the weekend, for instance, David Zurawik of The Baltimore Sun detailed how a Sinclair-owned station in Alabama ran a deceptive report in its local newscast to try to discredit The Washington Post’s coverage of women who say they were sexually assaulted by Republican Senate candidate Roy Moore when they were teenagers and he was in his 30s. Earlier this week, Bloomberg’s David McLaughlin, Scott Moritz, and Sara Forden reported that AT&T will ask a judge to provide the company with communications between the White House and the Justice Department if the government sues to stop the merger. That could make for some very interesting reading. Murdoch lurking in the wings. A super-empowered Sinclair wreaking havoc in television markets around the country. Traditional media being hamstrung by old laws while Facebook and Google continue to reign unchecked. Those would be reasons enough to approve the AT&T-Time Warner merger. But the specter that President Trump is attempting to orchestrate this as a way to punish a journalistic enemy looms over all of this. From time to time, some expert will predict that television is about to go the way of newspapers and music: disrupted by technology and broken into its constituent parts, with the dollars that used to flow like a mighty stream magically reduced to little droplets of digital dimes and pennies. And yes, it may happen someday. But the news that AT&T will seek to buy Time Warner for $85 billion shows that it’s not going to be soon. The executives who run the major telecom and television companies are proving to be tough, wily, and ready for a long battle. Compared to the genteel folks in the news and music industries, these guys are like the Medellín cartel. This broke at Bloomberg and is now being confirmed: In the face of opposition from the Justice Department and the FCC, Comcast is giving up on its proposed $45.2 billion merger with Time Warner Cable. This is a great victory for everyone who fought against Comcast’s bid to tighten its stranglehold on the telecommunications infrastructure on which all of us are so dependent. Kudos to Free Press and other public interest groups that worked so hard on this issue. One thing you can be sure of is that this and similar issues will be back, especially since the next administration is either likely (i.e., Hillary Clinton becomes president) or certain (a Republican is elected) to be more sympathetic to such deals than the Obama White House has been. Continued vigilance will be needed. Could Rupert Murdoch turn out to be the savior of CNN? Not directly, of course. After all, his Fox News Channel is a blight upon the civic landscape — a right-wing propaganda machine whose elderly viewers are, according to a 2012 Fairleigh Dickinson study, even less well-informed than people who watch no news at all. Nevertheless, I felt my pulse quickening last week when I learned that Murdoch is trying to add Time Warner to his international media empire. Among Time Warner’s holdings is CNN. And according to The New York Times, Murdoch would sell the once-great news organization in order to appease federal antitrust regulators. As you no doubt already know, CNN in recent years has fallen into the abyss. When I Googled up its increasingly ironic slogan, “The Most Trusted Name in News,” I was taken to a page at CNN.com dating back to 2003, complete with photos of former CNN hosts such as Aaron Brown, Judy Woodruff and Larry King, the seldom-seen Christiane Amanpour and others who evoke a better, more substantive era. These days, unfortunately, CNN is known mainly for its endless coverage of the missing Malaysian jetliner and for a series of embarrassing screw-ups, such as its misreporting of the Supreme Court’s decision on the Affordable Care Act in 2012 and its false report that a suspect had been arrested in the Boston Marathon bombing (to be fair, CNN was not alone on either mistake). Then, too, there have been a series of mystifyingly bad hires, such as the talentless yipping Brit Piers Morgan to replace Larry King and the creepy Eliot Spitzer to cohost a talk show. Even solid choices like Jake Tapper seem to disappear once brought into the CNN fold. Of course, it’s hard not to disappear when your ratings are lower than those of Fox and MSNBC. Is CNN worth saving? Absolutely. Its journalistic resources remain formidable. It’s still must-see TV when real news breaks, which certainly has been the case during the past week. Folks who are able to watch CNN International (I’m not among them) tell me it remains a good and serious news source. Anderson Cooper is among the more compelling figures in television news. But domestically, and especially in prime time, CNN has utterly lost its way — starting at the top, with its self-congratulatory president, Jeff Zucker, who wants us to believe that everything is proceeding according to plan. The time for a complete overhaul is long overdue. If Rupert Murdoch can help usher CNN into the hands of a new owner that might actually know what to do with it, then bring it on. Indeed, the fundamental ideas at the heart of his book are so blindingly self-evident that, in retrospect, it is hard to imagine it took a Harvard Business School professor to describe them for the first time. And that poses a problem for Jill Lepore, a Harvard historian who recently wrote a scathingly critical essay about Christensen’s theories for the New Yorker titled “The Disruption Machine.” Call it the Skeptic’s Dilemma. Christensen offers reams of data and graphs to support his claims, but his argument is easy to understand. Companies generally succeed by improving their products, upgrading their technology, and listening to their customers — processes that are at the heart of what Christensen calls “sustaining innovations.” What destroys some of those companies are “disruptive innovations” — crude, cheap at first, attacking from below, and gradually (or not) moving up the food chain. The “innovator’s dilemma” is that companies sometimes fail not in spite of doing everything right, but because they did everything right. 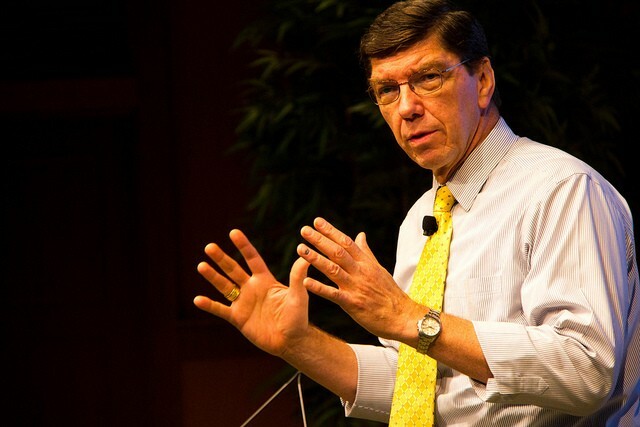 Clay Christensen in 2011. Photo (cc) by Betsy Weber. Some rights reserved. Christensen has applied his theories to journalism as well. In 2012 he wrote a long essay for Nieman Reports in collaboration with David Skok, a Canadian journalist who was then a Nieman Fellow and is now the digital adviser to Boston Globe editor Brian McGrory, and James Allworth, a regular contributor to the Harvard Business Review. 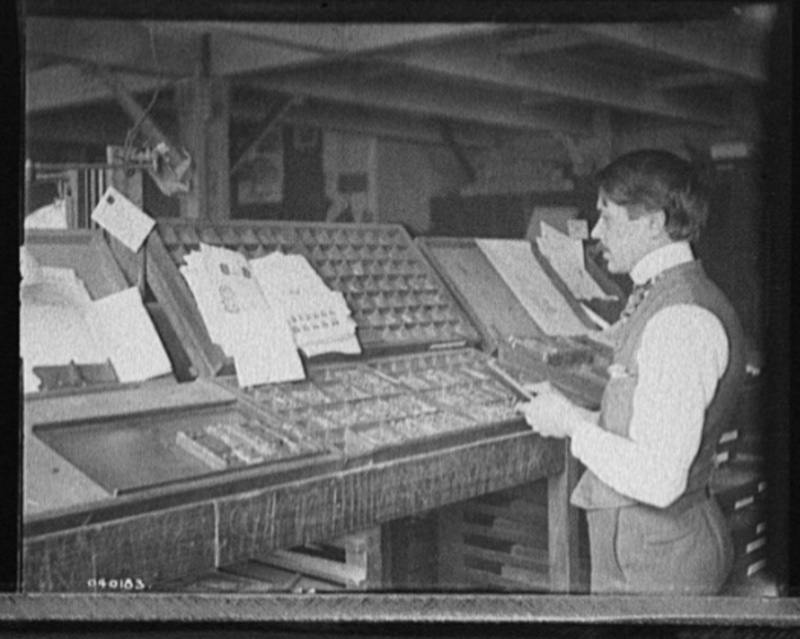 In the essay, titled “Breaking News,” they describe how Time magazine began in the 1920s as a cheaply produced aggregator, full of “rip-and-read copy from the day’s major publications,” and gradually moved up the journalistic chain by hiring reporters and producing original reportage. Today, they note, websites like the Huffington Post and BuzzFeed, which began as little more than aggregators, have begun “their march up the value network” in much the same way as Time some 90 years ago. And though Christensen, Skok, and Allworth don’t say it explicitly, Time magazine, once a disruptive innovator and long since ensconced as a crown jewel of the quality press, is now on the ropes — cast out of the Time Warner empire, as David Carr describes it in the New York Times, with little hope of long-term survival. INTO THIS SEA of obviousness sails Lepore, an award-winning historian and an accomplished journalist. I am an admirer of her 1998 book The Name of War: King Philip’s War and American Identity. Her 2010 New Yorker article on the Tea Party stands as a particularly astute, historically aware examination of a movement that waxes and wanes but that will not (as Eric Cantor recently learned) go away. The second approach Lepore pursues is more daring, as she takes the fight from her turf — history and culture — to Christensen’s. According to Lepore, Christensen made some key mistakes. The disk-drive companies that were supposedly done in by disruptive innovators eating away at their businesses from below actually did quite well, she writes. And she claims that his analysis of the steel industry is flawed by his failure to take into account the effects of labor strife. “Christensen’s sources are often dubious and his logic questionable,” Lepore argues. 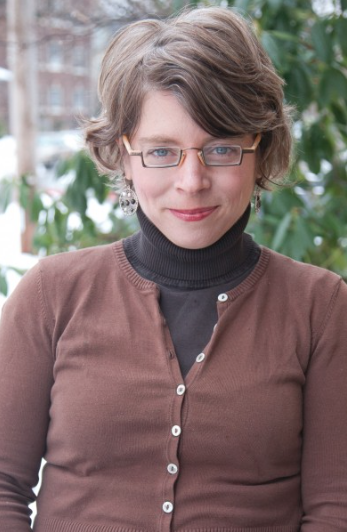 Jill Lepore. Publicity photo from her Harvard bio. But Lepore saves her real venom for the dubious effects she says the cult of disruption has had on society, from financial services (“it led to a global financial crisis”) to higher education (she partly blames a book Christensen co-authored, The Innovative University, for the rise of massive open online courses, or MOOCs, of which she takes a dim view) to journalism (one of several fields, she writes, with “obligations that lie outside the realm of earnings”). I was delighted that somebody with her standing would join me in trying to bring discipline and understanding around a very useful theory. I’ve been trying to do it for 20 years. And then in a stunning reversal, she starts instead to try to discredit Clay Christensen, in a really mean way. And mean is fine, but in order to discredit me, Jill had to break all of the rules of scholarship that she accused me of breaking — in just egregious ways, truly egregious ways. As for the “egregious” behavior of which he accuses Lepore, Christensen is especially worked up that she read The Innovator’s Dilemma, published 17 years ago, yet seems not to have read any of his subsequent books — books in which he says he continued to develop and refine his theories about disruptive innovation. He defends his data. And he explains his prediction that Apple’s iPhone would fail (a prediction mocked by Lepore) by saying that he initially thought it was a sustaining innovation that built on less expensive smartphones. Only later, he says, did he realize that it was a disruptive innovation aimed at laptops — less capable than laptops, but also cheaper and easier to carry. CHRISTENSEN’S DESCRIPTION of how his understanding of the iPhone evolved demonstrates a weakness of disruption theory: It’s far easier to explain the rise and fall of companies in terms of sustaining and disruptive innovations after the fact, when you can pick them apart and make them the subject of case studies.